KILLBOX #1 Preview In FAMOUS MONSTERS #285! Can’t wait until April 27th to enter the Killbox? No worries! We have an exclusive 4-page preview in the latest FAMOUS MONSTERS OF FILMLAND #285! Written by Tom Riordan and illustrated by Nathan Gooden, KILLBOX #1 brings a battle royale to the streets of Los Angeles, where high-stakes underground gambling on human life is in high demand. We follow bartender Timothy Choir as he risks life and limb to win the deranged game and help his son who has leukemia. Action-packed and beautifully violent, KILLBOX is one you do not want to miss! Also in this issue of FAMOUS MONSTERS, we celebrate the 35th Anniversary of CLASH OF THE TITANS with star Harry Hamlin! GAME OF THRONES coverage with co-creator D.B. Weiss and star Isaac Hempstead Wright. We preview CAPTAIN AMERICA: CIVIL WAR and interview directors Joe & Anthony Russo. Also in this issue: THE HOWLING, WARCRAFT, THE HUNTSMAN: WINTER’S WAR, PENNY DREADFUL, and many more! Don’t stare too long at that Sanjulian Medusa cover though, for you might turn to stone! 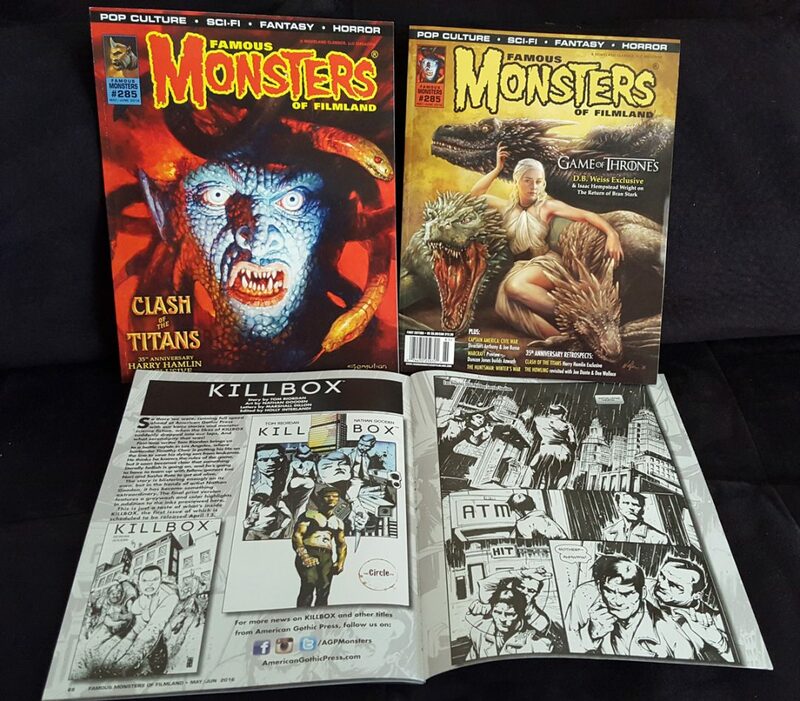 You can purchase FAMOUS MONSTERS #285 on CaptainCo.com, and newsstands everywhere.